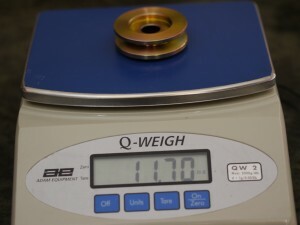 I don't have a set of original 302 Camaro pulleys to compare to, but I suspect I'll be able to save a bit of weight with an aftermarket set. Purchased the kit from March Performance. It is reasonably priced, made of billet aluminum instead of chrome, and has deep grooves for the v-belts. 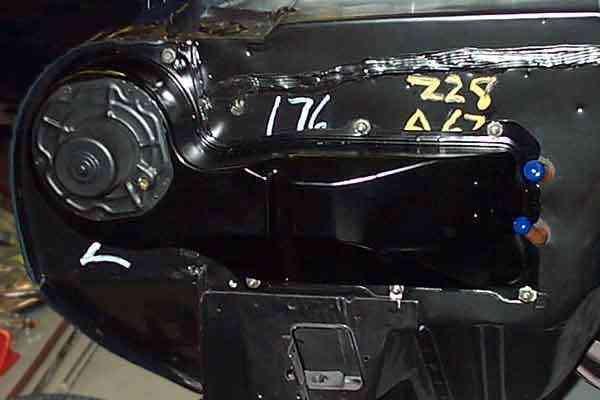 These cars have a reputation for "throwing" belts at high rpm, and the deeper pulley grooves help this. March also has a ton of wacky serpentine conversion kits to move it all to a modern single-belt system, but alas, this would not be legal. Felt heavier than it looked. Probably some kind of plated steel. 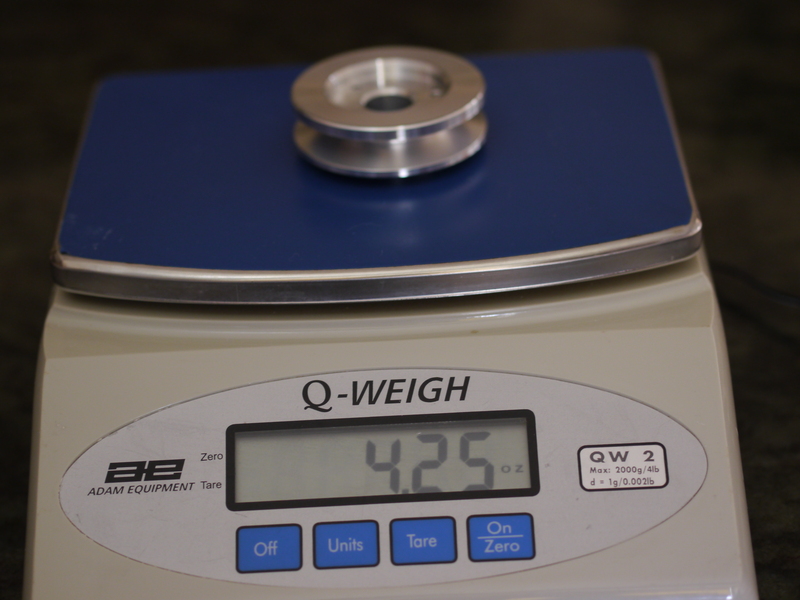 7.45 ounce difference - almost half a pound! 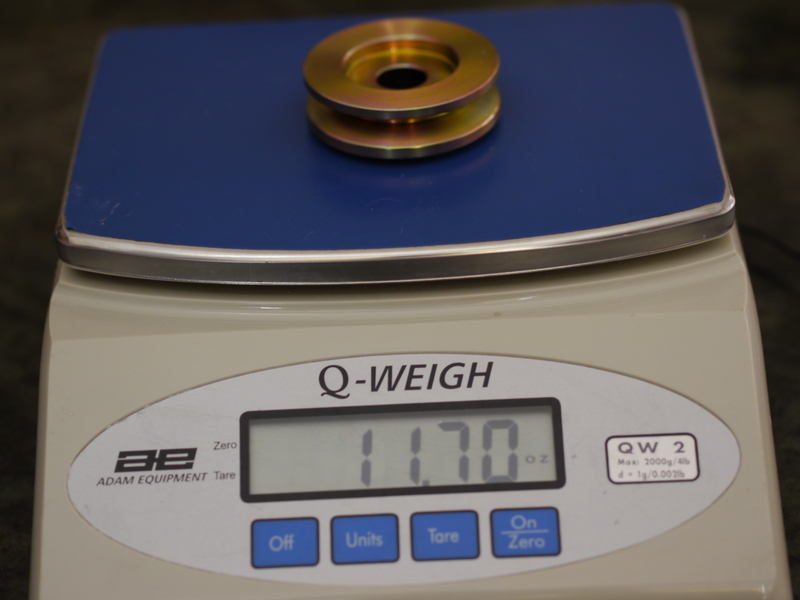 Pretty significant for a pulley only about 2.5" in diameter. Besides being up high and forward of the front wheels, this thing also turns much faster than engine speed, due to the diameter difference from the crank pulley. So three wins on the weight side for this pulley. Will be using the March pulleys for the remaining pieces - crank pulley (2-belt), water pump pulley, and power steering pulley. 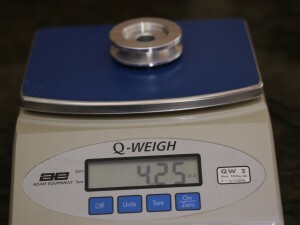 Since the other pulleys are all larger than this, I suspect this will add up to several pounds of rotating weight off the nose, a great help! 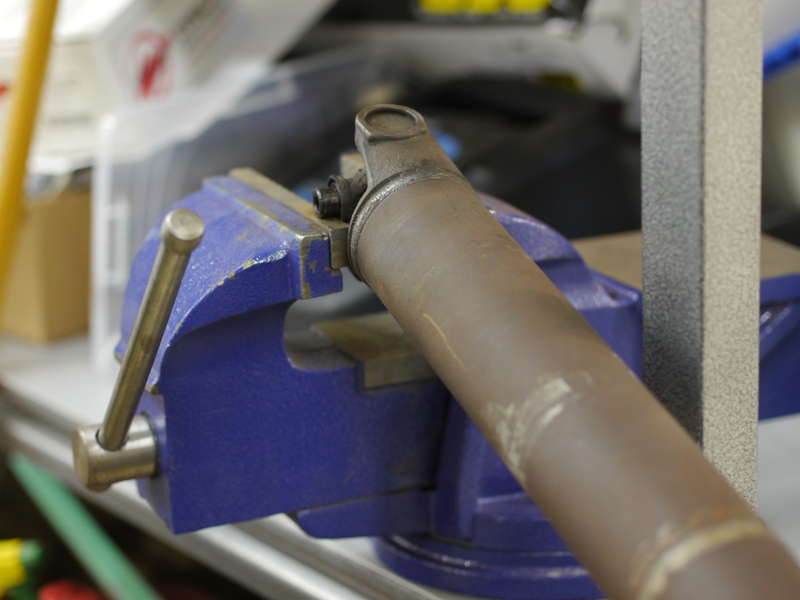 The driveshaft was one of the few things I haven't had to buy, the unit in the car was correct, stock, and appeared in decent, if dirty, condition. 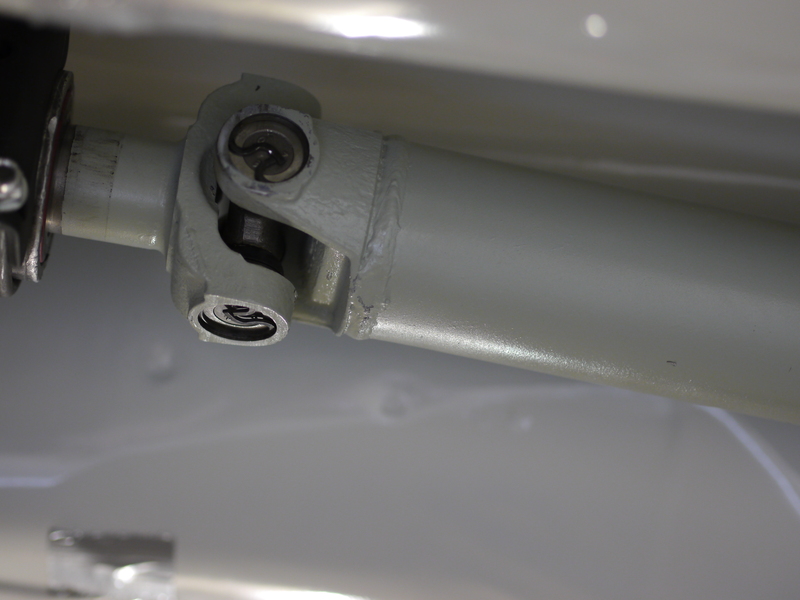 Still, wasn't going to put a rusty, covered in red overspray, worn out driveshaft under the clean car, even if it is bound to get thrashed. Banged out the original u-joints. They didn't look too bad actually. Since the car had an open 3.07 rear, maybe it hadn't lived too hard a life? 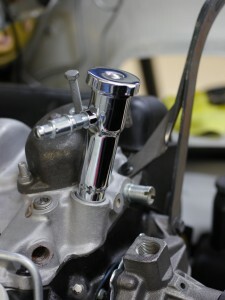 This part wasn't too hard, and is a prerequisite to hanging the exhaust system, which is here now. The second one is from a Car Craft article - Car Craft photo source - check it out there to help with their ad revenue! 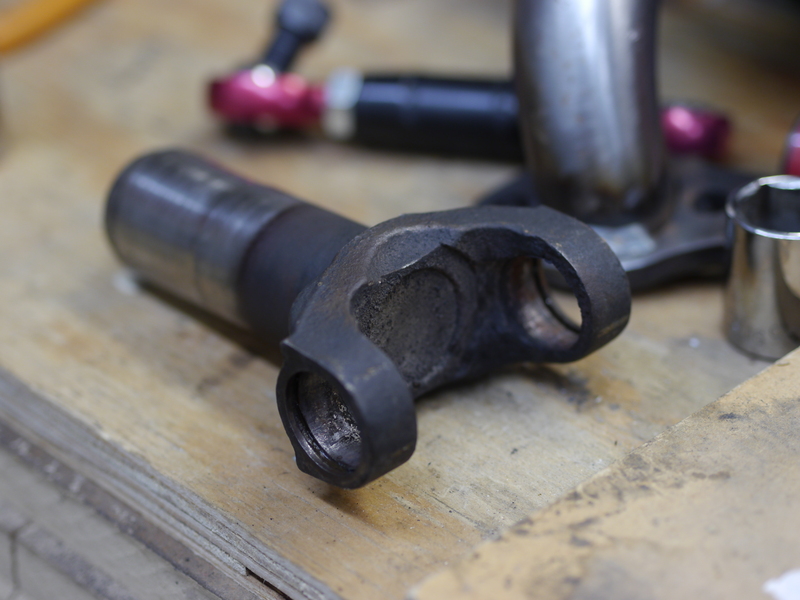 He said these were cut at the factory with an air chisel, but that is accurate. 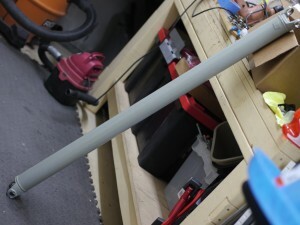 You can see the edge of the hole in the first link above with the dual-quad air cleaner removed. Of course you don't need to run this exact air cleaner (and you can't find one for any amount of money), but that hole probably needs to be there. Somebody will notice that missing. The cowl air cleaner is an entertaining bit of original Z28 lore. 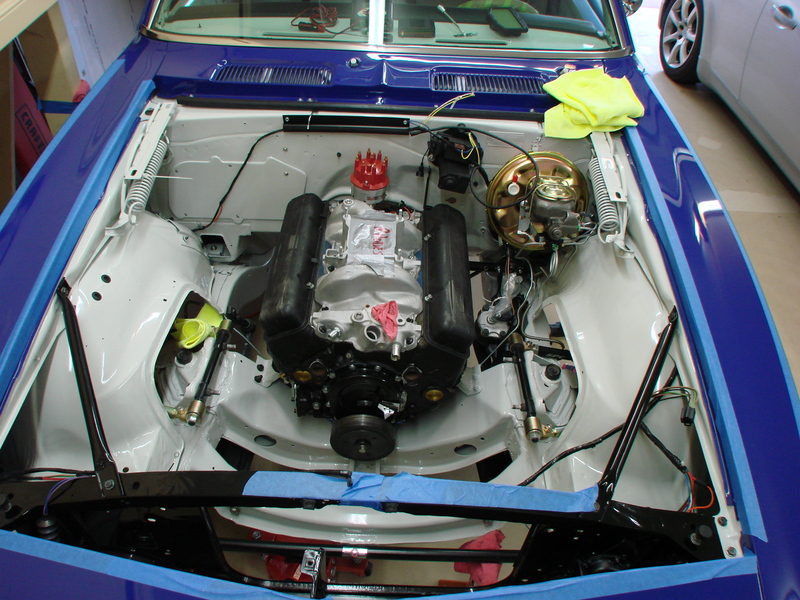 Ed contends the firewall holes for the air cleaner were cut (coursely, it would seem) at the factory on all '67 Z28s. 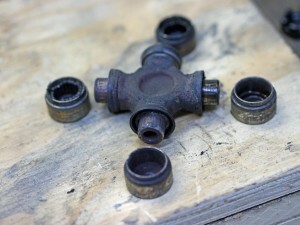 Terry extends this to say, that I need to have the hole, since it would have been part of every '67 Z28 chassis, even if I don't intend to use it. 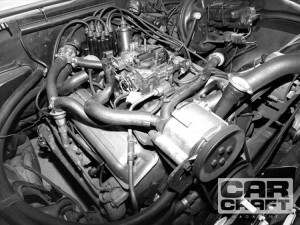 The truth is, that intake option was available from the factory, but it was delivered as one of the earliest examples of what the SCCA calls (rather appropriately in this case) a "trunk kit". Trunk kits are defined in the SCCA rulebook as "post-factory performance kits". 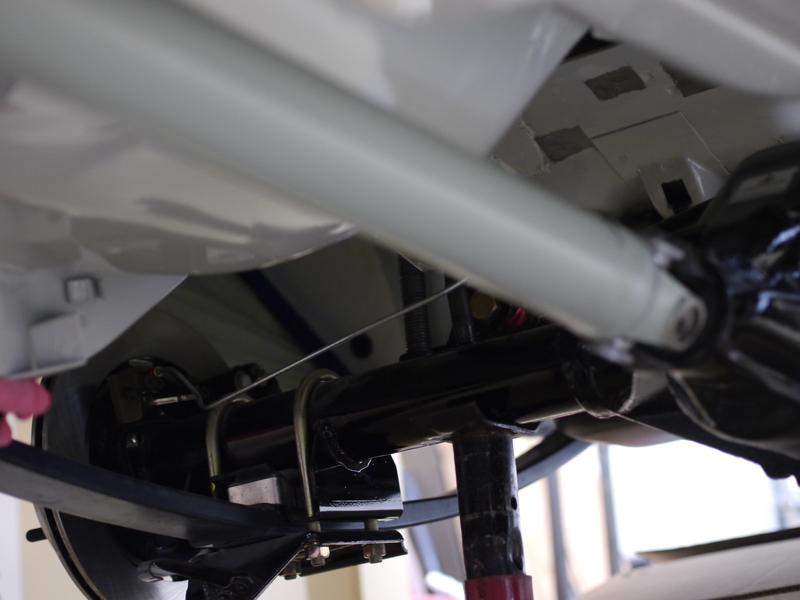 Frankly the lines on what is and isn't a trunk kit is a bit confusing to me, as some recent cars (Mazda MX-5 MSR and Pontiac Solstice Z0K) have been deemed legal with some trunk-kit type suspension stuff. 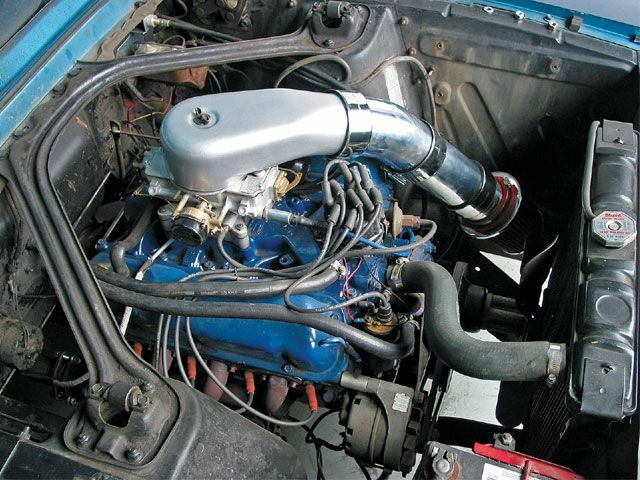 Not a huge deal here, as I can probably find another way to accomplish a good cold air intake. Still, for as unsophisticated as many parts of this car were, the orignal 1967 cold air intake design is actually very good - pulling cold air from a high pressure area at the base of the windshield, without a lot of complex routing. Also alleviates the need for a big ugly scoop on the hood - not a fan of those for their looks from the outside, and for what they do to visibility from the inside. 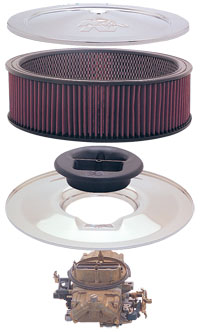 For the Z/28, the cowl plenum air cleaner was available as a regular production option or as a service part. 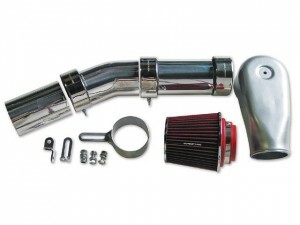 With an RPO Z282 package, a Z/28 would come with the cowl plenum air cleaner shipped in the trunk. An RPO Z284 package would provide a Z/28 with the air cleaner and set of exhaust headers. If factory ordered, the air cleaner was shipped in the trunk with installation instructions that showed where to cut the firewall hole. The method for cutting the hole was left up to the installer. I've gone back to that site countless times to review things like brake line routing, shifter hole placement, etc. It's extremely good, even though the pictures are a bit lower resolution that I would like, or than we've grown accustomed to in 2010+. 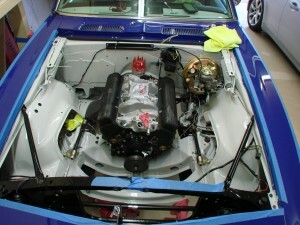 In the picture above you can see this original '67 Z28 Camaro firewall, without the cowl plenum air cleaner hole cut. So, I can't run it, but would really like to. The original Trans-Am guys ran it single-carb in '67 and into '68, and later ran a revised version that fit the dual-carb induction setup Chevrolet homologated. An interesting observation in researching alternative cold air intake (CAI) solutions for the car, is how little attention people seem to have paid to this aspect of performance in these cars. My impression was if you asked a hot rodder what "C A I" stood for, providing the hint it had something to do with the intake, they'd probably guess "Chrome Air Intake". You can find 10,000 different chrome air cleaner lids for these cars, but practically nothing built for performance, short of some tall intake stuff designed to work with monster hood scoops. This sort of intake looks a little bit funny on a carbureted car, but should work. They have a kit now for the first-gen Camaro with a little blockoff plate, where the filter goes in the front passenger corner, the original home for the battery. Carburetors are a bit like MAF (Mass Air Flow) sensors, in that they expect the air they ingest to come from certain paths and angles. Not sure how this sort of kit would affect things. But haven't really been able to find any good third-party test results for any of these things. 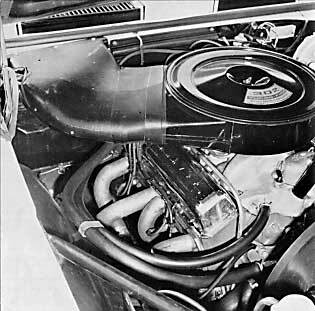 The old world of small-block-Chevy engine tuning seems lacking in some of the basic A-B scientific part tests we expect to see on modern platforms. They could be junk. So, as of today, still not sure what I'll do for induction. 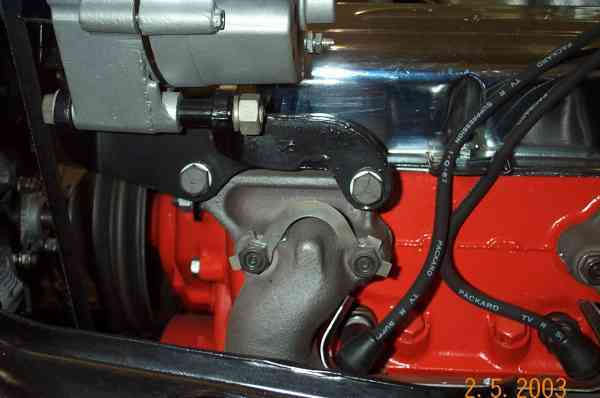 Even with the Swain coating on the headers, it'll be hot underhood, and I'd like the engine to retain consistent performance when being run hard. The factory trunk kit piece would be perfect from a performance, simplicity, and classic authenticity point of view, but unfortunately I don't think it can be considered legal, despite many many hours of research, looking for an angle where it arguably could be. Many thanks to Terry, Ed, and the Vorshlag crew for their thoughtful message. I'm sure they can appreciate the amusing irony, or being called out for not running a part, you wish you could! A recent thread on the new Toyota Scion FRS & Subaru BRZ on roadrace-autox.com took an interesting turn around post #3680, when someone opined on where the car should go in the Street Touring category. Now that Street Touring has moved from seats-and-displacement based classing, to one relying on subjective assessment of vehicle performance, there are many places where a given car could land. As a normally aspirated and lightweight 2+2, the FRS/BRZ could fit in many of the classes, and every single one - STC, STS, STX, STR, and STU, have been mentioned. A good bit of the discussion was on how the car would fit in STX, given how similar it is to the RX8. Some dynos were shared and thoughts on acceleration given. Since I'd already collected the data for some other STX cars, it was not too much work to provide an STX-centric thrust spreadsheet, which I've linked to below here. There's still a lot unknown about the FRS/BRZ, including what size tires it can fit. Feel free to download this spreadsheet and make adjustments as you see fit. Based on what I've seen so far, the accelerative capability (which by no means dictates in-class performance!) looks to be on par with the RWD class leaders in STX. 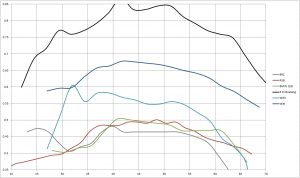 The BMW 328 appears to have a slight edge over 55mph, and the Scionaru would appear to have an edge at very low speeds (~25) which could possibly be an edge up to 35mph if there were a way to tune out the torque dip. These all pale in comparison to the nearly-forgotten WRX, which dominated the class for so long but has been out of favor in recent years. 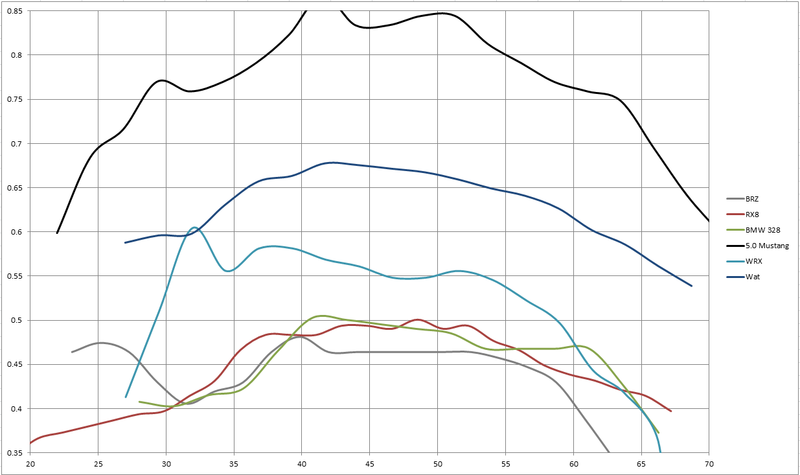 The sample data I've provided here for the Camaro includes a very optimistic curb weight, and dyno numbers from a magazine engine build, that are possibly somewhat representative, but certainly not identical, to a stock-legal engine build for the same motor.